Home / Home Buying / Will this home appreciate? For most people, a home purchase is the biggest single investment they’ll ever make, so it’s natural to hope for some return on that investment. In monetary terms, that means home appreciation. When you buy a home, you hope it’ll be worth more than you paid for it by the time you’re ready to sell and move on. We’ll be honest: there’s no failsafe way to predict trends in home values. So, given the unpredictable nature of the real estate market, what should you know about home appreciation before you buy? Read on for some tips. Maybe you just fell in love with a home in an up-and-coming neighborhood or city. But just because you’re convinced that the house you’re considering will appreciate doesn’t mean you should buy it if it’s outside your budget. At SmartAsset, we’ve got a tool to help you figure out how much house you can afford. Plug in the numbers and then stick to your budget. That way, you can enjoy your home without the stress of too-high mortgage payments. Once you’re in a house you can afford and you’re enjoying living there, don’t obsess about whether its value will go up over time. If you’re buying a home that will be your primary residence (as opposed to an investment property) it should meet your needs, not the needs of a hypothetical future buyer. Find a place you like and don’t worry too much about home appreciation, since it’s mostly beyond your control anyway. If your house is already quite old, an appraiser might tell you not to bother making expensive upgrades to it unless you want them for yourself. The appraiser may say that anyone who would buy your home could afford to—and probably would—make major changes, so don’t bother making them yourself. Another point to remember: sometimes, a house will appreciate even if it’s falling down or has questionable décor. If the neighborhood becomes more desirable, buyers will often look past the house itself. If you know the real estate market in your neighborhood has gotten hotter since you moved in, you can probably save yourself the money and effort of making upgrades to attract buyers. Know the difference between home appreciation and inflation. The sticker price of a home might go up over time, but is that rise due to home appreciation or inflation? Often, home values don’t appreciate above the rate of inflation, so when you sell you’re not getting much in the way of real gains. When available, check inflation-adjusted home value trends to make sure you’re getting a clear picture of home appreciation in your city or state. 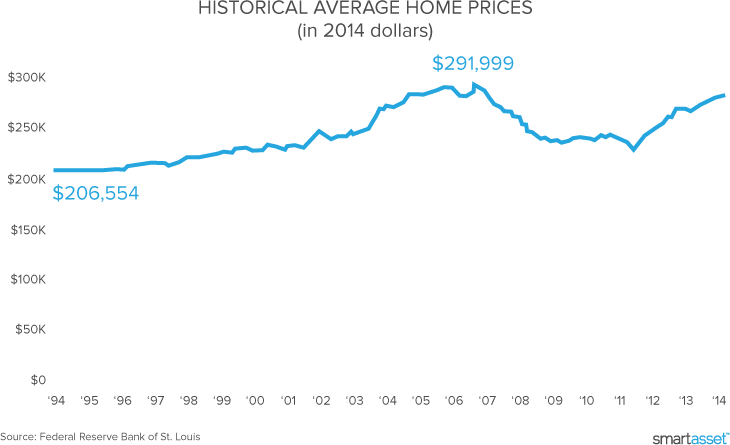 Another factor to consider is a different kind of inflation - the inflating size of US homes. The average home size in this country keeps going up and up. So are homes getting more valuable per square foot, or are house prices just rising because homes are getting bigger and bigger homes cost more? It’s another reason for some healthy skepticism when you look at data on rising house prices. Whether your home will appreciate over time is mostly out of your control. Some unexpected things that could raise the value of your home: new schools in the neighborhood, job growth in your area, more household formation (aka demand for homes), an influx of investors and new residents, gentrification, etc. Some unexpected things that could decrease the value of your home: destructive weather events, crime sprees, school closures, job loss in your area, foreclosures, vacant homes, ugly new development, increase in local supply of homes, spike in property tax rates, zombie invasion, etc. Unless it’s really your hobby, that is. Home flipping—buying a run-down home, putting a lot of work and money into it and selling it for a much higher price than you paid—works better on reality TV than it does in… reality. These days, would-be flippers risk putting lots of time, work and money into a home they can’t sell, or can only sell at a loss. In general it’s a good idea to buy a fixer-upper because you want to put the work into the home for your own enjoyment, not because you expect big returns on your labor. Where will go after you sell your home? You think you want your home to appreciate, but do you really? Remember, when you sell your home, you’ll have to find somewhere else to live. Want to stay in the same area? That could prove tough if prices are high across the board, especially if you want to move to a bigger home. You sell your home for a high price but now you are stuck paying an even higher price to get a bigger home in the same area. People living in some of America’s hottest real estate markets are complaining that they’re afraid to sell their homes because they’re not confident they could find (and afford) a new place to live. Before selling a home in a tight real estate market, it’s wise to add a contingency to the contract that stipulates you won’t have to go through with the sale if you can’t find a new home to buy. Of course, if you plan to stay in your home until your last day on earth, you may want the home to appreciate so your heirs can get rich when they sell the home. But if you think you’ll move—and not to a cheaper area—be careful about wishing for massive home appreciation in your neighborhood’s average home value. The housing market has a natural back and forth between buyers’ markets and sellers’ markets. That’s not a bad thing, but it means that the date you want to sell your home might not be the best point in the market cycle for you to do so. With all the advice out there for homebuyers, it’s easy to forget that we all make decisions based on imperfect information. SmartAsset is here to help, though.